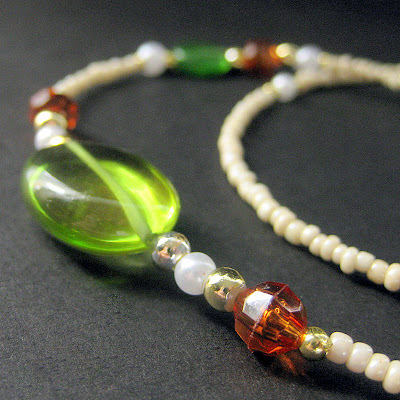 Vibrant, shimmering beads in shades of green and amber are strung along a strand of cream in this handmade beaded badge lanyard with just a touch of golden finish. So many people these days are required to wear badge lanyards for work. It isn't just nurses anymore. I grew up in a military town and the people who work on the base had to wear them. So too, now days, do teachers and sometimes even students. Not to mention most grocery workers, all government workers, lab workers and anyone else who has to wear a badge. And if you have to wear one, why not make it one you love? That's why I create a variety of fully beaded badge lanyards, made with smooth beads at the nape for the comfort of the wearer and decorative beads further down the strand to show off their beauty and create a decorative style. I even offer an optional "break away" magnetic clasp for those that need it!